Vacation rental townhouse. Sleeps 8, 3 bedrooms, 2.5 bathrooms. No pets allowed. 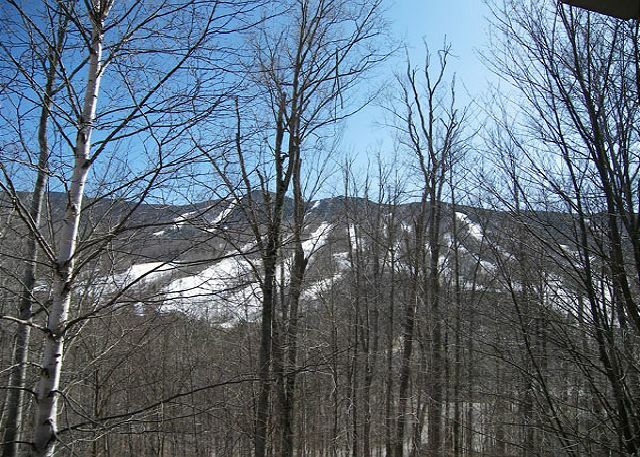 Winter View of Loon Mountain from the deck. 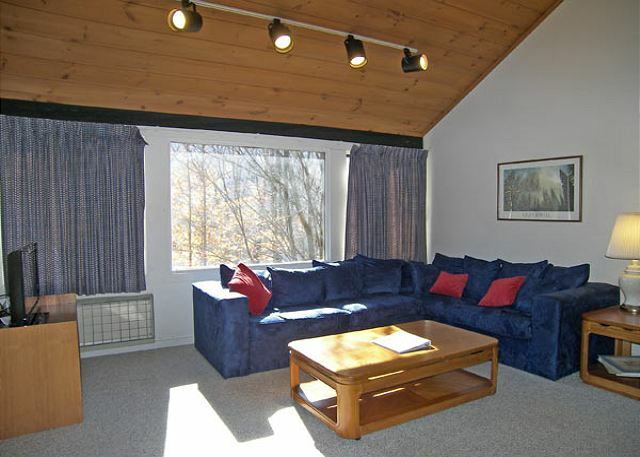 Living room with wrap-around couch and flat screen television. Alternate view of the living room. Dining area with seating for eight. Entry level bedroom with two twin beds. 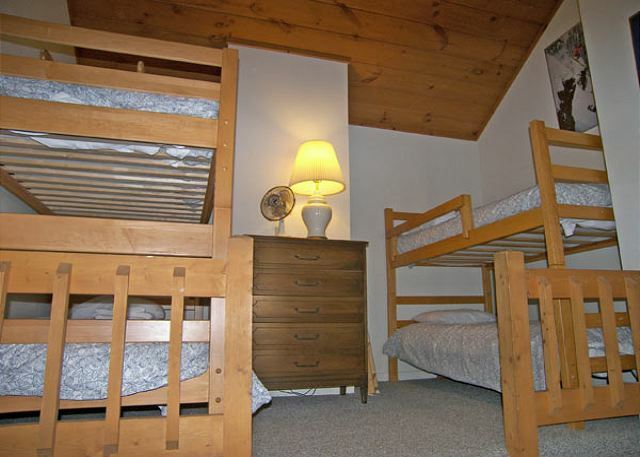 Bedroom with two sets of bunk beds. 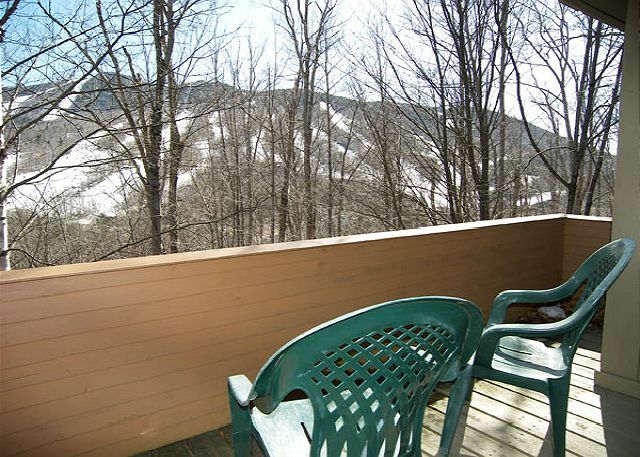 This townhouse is built on the hillside and commands a beautiful winter view of Loon Mountain across the valley. On the entry level is a bedroom with two twin beds and a full bath just outside the bedroom door. Down a level from the entry is the master bedroom with queen bed and full private bath. Upstairs from the entry is the living, dining and kitchen area with wood burning fireplace and and access to the deck. The final level of this townhouse holds the third bedroom with two sets of bunk beds and a half bath. 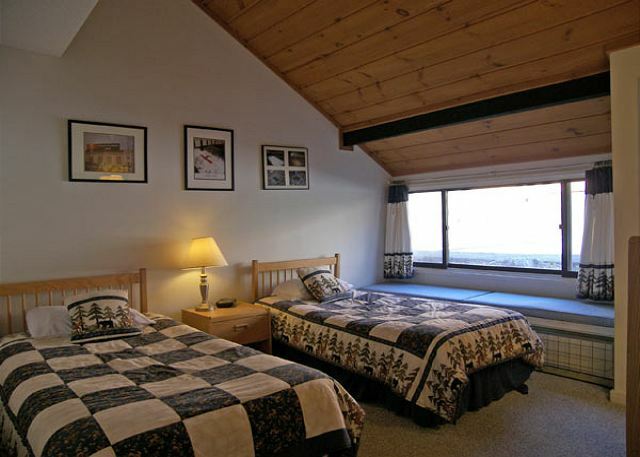 Great location - access to skiing , tubing , ice skating . It would have been nice if the townhouse had supplied a few staple condiments - I had to run out to buy salt . Also, a few extra towels would have been welcome . Kitchen was well supplied with dishes and pots and pans . Mattresses could use an upgrade . Plenty of room for our party of 8. The condo was perfect for our over flow of family who were visiting during Christmas break week. Great house, spacious, 5 min shuttle to mountain, no complaints!! My second time staying at village of loon and Is always a satisfying stay. Really enjoyed, nice place to stay. We rented the house for 4 adults and 2 children during school vacation week. The condo was neat and clean upon arrival and the view of Loon Mountain was stunning. We enjoyed the wood burning fireplace every night. Kitchen is small but doable. Bedrooms are sufficient, although the mattresses were quite hard (my only complaint). 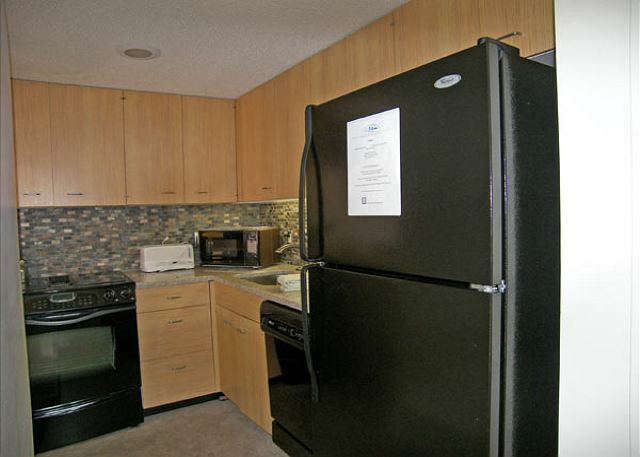 Great rental - would definitely rent this unit again. Family of 6 skiing for a long weekend. Perfect location. Great condo! My Stay with loon was great! The house was so clean and comfortable....service is Great there!...would only go back there if I go again to NEW HAMPSHIRE! We were lucky enough to be able to reserve this unit over the July 4 Holiday period. We found the place to be VERY clean with LOTS of room. We had 5 adults and two little girls (7 and 5). The only negative was that it doesn't have a gas grill. We ended up bringing an electric grill with us and it was ok. While we were there the temperatures were mild but not too hot. Since there is no AC in the place, I'm wondering what it would have been like had the weather been warmer. The location is great for doing things in the White Mountains. We visited several of the area attractions. The staff was very good--friendly, courteous and helpful. The property was very nice but not suited to our specific needs. We're there to work at the Highland Games and we need a generous kitchen for our food prep in the morning and evening. The high ceiling made it difficult to adequately heat the space and we just wore extra layers instead of cranking the electric heat. We got this accommodation at the very last minute due to an oversight (I thought we had confirmed it back in January!) so we were grateful to have such a convenient place near our job site. Next year we would like to go back to Deer Run if possible. Can you please send a reminder in mid-December? We're glad that we were able to fit you in last minute. We've made a note on our calendar to remind all past-year Highland Games guests once the December 15th booking date has arrived. Hi Thank You! We had a wonderful stay. The house was bigger than we expected and very comfortable. The location was amazing, right near many activities. Check in and check out went very smoothly. Just check out was a little earlier than we expected, we would have likes 11am rather than 10 but was okay. The grounds were very nice, and pool was great! Thanx for a great stay! Would definitely return and recommend to others to stay here as well. Fits 8 people very comfortably. 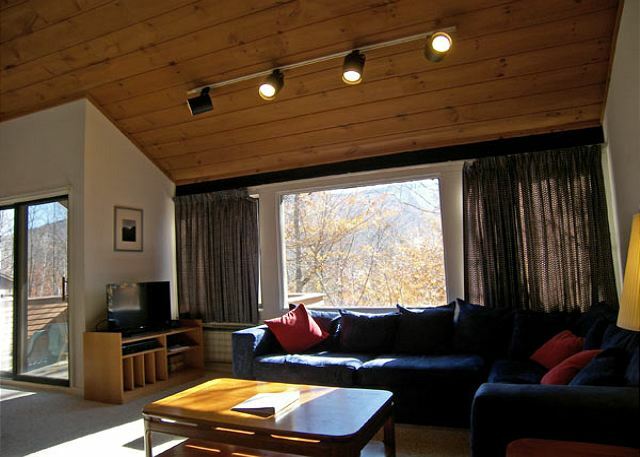 Ideal for a family of 8, and a get away for friends! Two families (4 adults and 3 children) easily fit in this condo unit. The good: amazing location to Loon mountain and Lincoln. The unit had everything we needed and was clean plus the use of the lodge pools was a major bonus. The bad: when we arrived, the unit was really, really musty, even after we had the windows open for 24 hours. If you have a tendency toward allergies, maybe consider a unit with hardwood flooring instead. 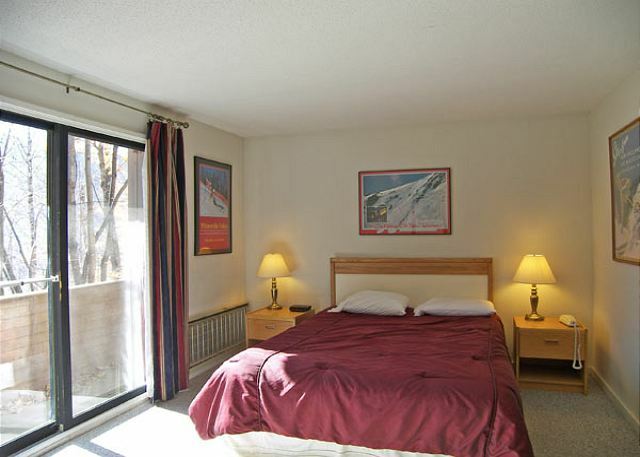 Pleasant overall, well furnished and maintained and no major problems. The condo size and location was perfect for a group of 8-10 friends. It was right across the street from the mountain and had enough space and proximity to town. We had a great time! This home is great for 8 people (doesn't actually sleep 10). We're glad that you enjoyed it! Great stay and unit overall, one suggestion....need additional TVs should have one in each bed room!!! Thanks for your comments - we'll be sure to pass them on. Glad that you had a great stay! Had a great time, nice restaurants in Lincoln and Woodstock area. The pools and tennis courts were good. We went to Echo lake, the basin, cascade waterfalls had a blast swimming in the water holes. Went to Conway for one of the days and Attitash mountain. Overall had a great time with family, and wouldn't hesitate to return again some day. We would love to see you again! It's great when you are able to enjoy so many of our local attractions and use us as a home base for your vacation! Spacious condo, great location, would definitely return. Happy to hear that everything was perfect and you enjoyed your stay! The condo was perfect for our needs. The kitchen was very well stocked with the exception of 2 items that were needed, oven mitts and a cutting board. Glad you enjoyed your stay! We are just going through our annual spring clean season, and will make sure that those items get replaced. because the service and the area is great. Location was perfect for family. Will return again. I was very satisfied with the property and the site. Great condo. We prefer to stay on the mountain but very near. Great condo. Plenty of room and all the amenities. Enjoyable, relaxing, convenient and beautiful. Thank you! Overal great location and price. Some for the furnitire was broken. Internet would be a huge plus. We will certainly use Loon Reservation service again and recommend your service to others. The office staff and is most helpful and accomodating. We as usual enjoyed our stay. but 56 E needs some updating. Village of Loon 56E had a great location. The condo was a nice size and clean, but a bit out-dated. The kitchen was missing a few items... The coffee filters supplied did not fit the coffee maker and there was no spatula to be found, so breakfast on the first morning was a challenge. Other than that, it had wonderful views of the mountain and was quite comfortable. Next time it will be a must! One--One Of The Bar Stools Was Broken And We Weren't Made Aware Of It. Ideally, could use a biger kitchen and upgraded baths. For the high cost, be less demanding of the chores you require of guests on departure. We stayed at a condo across from loon Mtn and had a great time. We shared it with another family and felt we had plenty of space for all 8 of us. The kids loved the bunk beds. We loved the easy drive to the mtn. (or optional shuttle bus). We also liked using the facilities at the Village, the pool and game room. The condo was neat and clean and everything was in good working order!